2- What is the need for reforestation? 3-What should the fundraising target be? 4-What does each donor receive and how much communication with the donors will there be? 5-What happens if we raise more than expected? 6-How can I or my community or my business calculate the amount of forest needed to offset our carbon emissions? 7-How long will it take for our carbon footprint to be balanced by a Forest the Size of Anywhere? 8-What if i want to absorb all my CO2 in one year? 9-What kind of businesses, organisations, and communities can raise funds to plant their size forest? 10-Can I still donate as an individual? 11-I have already donated, what other steps can I take to reduce my carbon footprint? 12-How do your partners ensure the protection of an area once reforestation gets underway? 13-How do you consult local people in India? 14-How is the data of donors protected? 15-How do we contact you if we come up against problems? Reforestation is the action of planting seeds and saplings in areas that for a multitude of different reasons have been deforested. Why reforest? Because trees are vital for biodiversity, soil health, climate control, water availability, and crucially, they provide the very air that we breath! 2-What is the need for reforestation? Reforestation in the tropics is one of the most effective ways to remove CO2 from the atmosphere. This does not then provide an excuse to carry on with ‘business as usual’. However, it is something we can do now along side transforming our behaviours, our economy and our relationship to the natural world and its resources. There are numerous additional benefits to reforestation such as: restoring and maintaining soil health, stopping and reversing biodiversity loss, helping build resilience to extreme weather events for wildlife and communities, improving water retention, air quality, and providing sustainable livelihoods for some of the world’s poorest. Also, trees are beautiful! There is no overall target for ‘The Forest the Size of Anywhere’, we just want as many forests to be restored as possible! ‘Absorb My CO2’: The average annual carbon footprint of an individual in the UK is 7.5 tonnes of CO2. To remove this much CO2 would require 7 trees to be planted in the tropics. This will cost £22.06, which breaks down to less than the cost of a coffee per month. We encourage all donors to subscribe to our social media channels in order to receive our updates on what is happening on the ground. If you are donating as a gift, please email reforestation@theconvergingworld.org with the name you would like on the gift certificate and whether you have donated to ‘Tree Peeps’, ‘Forest Cover my Area’ or ‘Absorb My CO2’ and one of our team will arrange for a gift certificate to be emailed to you. If your campaign raises more than your target, our partners have the capacity to receive substantial donations and spend them wisely on reforestation projects. However, if we raise more than they have capacity to spend we are in touch with at least 8 other projects through our networks and will keep you all informed. 6-How can I, my community, or my business calculate the amount of forest needed to offset our carbon emissions? 7-How long will it take for our carbon footprint to be balanced by a ‘Forest the Size of Anywhere’? We estimate that every tree planted will absorb over 1 tonne of CO2 over its 100-year lifetime, with the majority of this taking place within the first 20-50 years of growth. Sound slow? Reforestation is one of the simplest and most affordable ways to remove CO2 from the atmosphere. Other climate conscious choices you decide to make, although of course critically important, will avoid further CO2 emissions. Trees are a tried and tested carbon sequestration technology that is available to be used at the scale needed! Planting trees allows you to take action to balance the carbon you have already produced. It is very difficult to get scientific evidence that will support a definitive answer on this. However, we do know that soil and forest restoration does absorb CO2. Taking our averages above we needed to absorb 7.5tonnes of CO2 in one year, we estimate that 676 trees would need to be planted. 9-What kind of businesses, organisations, and communities can raise funds to plant a forest their size? Every kind. There is no group too large or too small to take part. ‘The Forest the Size of Anywhere’ is designed specifically so anyone and everyone can take part. Yes! You can still make your own donation, to- ‘Tree Peeps’, ‘Forest Cover My Area’ or ‘Absorb My CO2’. However, the more people in your organisation or community you can encourage to donate, the better! Reforestation is a very important, cost-effective, and a great way to reduce your climate impact however donating to reforestation is not an excuse to carry on with ‘business as usual’. There are many easy steps that you can take to reduce your climate impact, some of which can be found here. 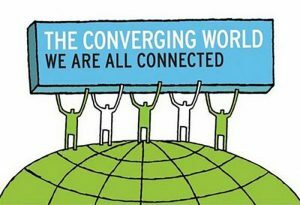 The Converging World chooses to work with partners based on their reputation and their project impact. In order to ensure a project’s success, it is vital that the local community is engaged and involved in the process because they will be the ones to safeguard the forest once the project is completed. All of our project partners have different methods of doing this, for example, Pitchandikulam Bio Resource Centre uses the restoration work to support local livelihoods, which protects the forest through a process called social fencing. This varies depending on our planting partner, please see our partner page for more information. If you are concerned with data protection please refer to our Privacy Statement and T+C’s. We do not share personal data with our partners.